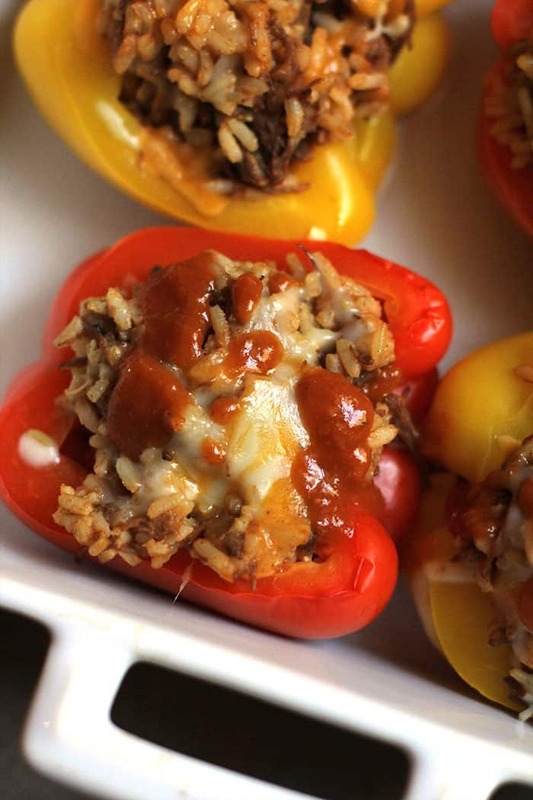 Mexican Beef Stuffed Peppers are not only delicious, but are a colorful “eat with your eyes first” type of food. I love all the flavors in this dish, but you could adapt it to your liking! 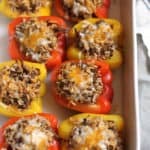 How to make the best stuffed peppers. I used to make a stuffed pepper dish long ago. For some reason, Zach remembers it, and has been asking for stuffed peppers forever now. So I finally broke down and created THIS just for him. 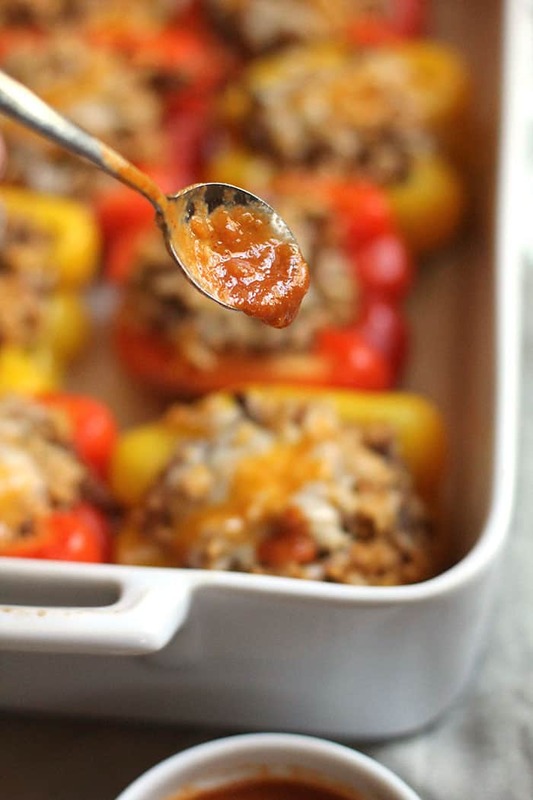 Truth be told, you can stuff peppers with anything. However, I love Tex-Mex, so of course, this is what I created. The beef. You can make it in your crockpot, stove top, or instant pot. All are equally great. 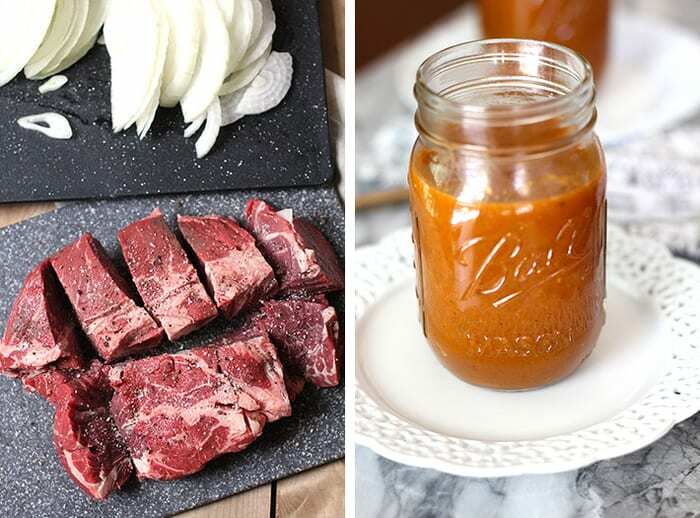 Just make sure you take the time to sauté it first so that the juices stay locked inside. The sauce. I’ve been making my homemade enchilada sauce on repeat these days. It’s good on almost anything, and I like to keep a couple jars in my freezer at all times. The rice. Feel free to use any type of rice that you like. We eat a lot of brown rice at our house, but white would be delicious as well. The peppers. It’s best to par-boil the peppers for a few minutes before stuffing them. 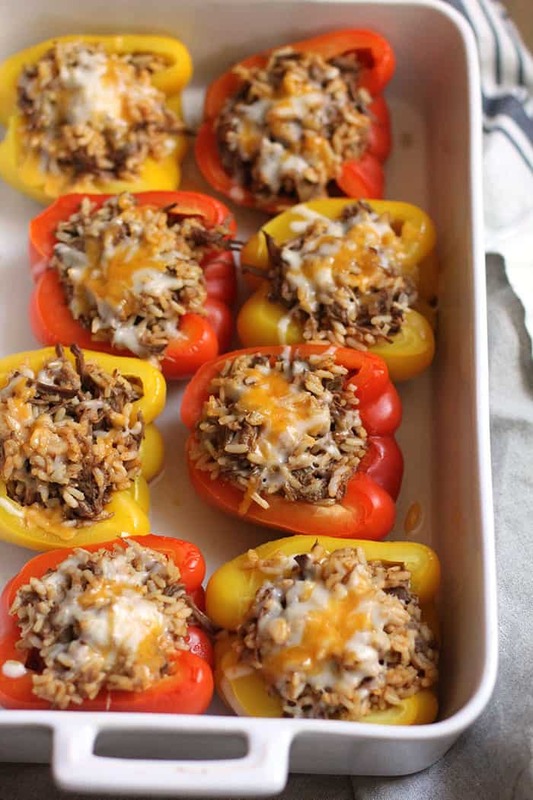 You don’t want them too soft or you’ll end up with mushy stuffed peppers. You can prep in advance. You can prep this entire meal in advance, and store it in the refrigerator for a day or so. Although I haven’t done it, I believe freezing this dish would be just fine. Wrap it tightly and cover in a freezer bag. We’re huge Tex-Mex lovers in our home. Living in Texas has it’s advantages, outside of warmer winters. A big plus is access to great Mexican food, and trust me, we’ve tried tons of it. With Cinco de Mayo around the corner, I’m dreaming about all of the things – like tacos, enchiladas, burritos, nachos, salsa, and margaritas. If you are eating Tex-Mex, you HAVE to have a great margarita. So just in case you are cooking at home for your Mexican fiesta, take a look at my Classic Skinny Margarita, Blueberry Lime Margarita, or Frozen Blackberry Peach Margarita. I love them all. SO much. 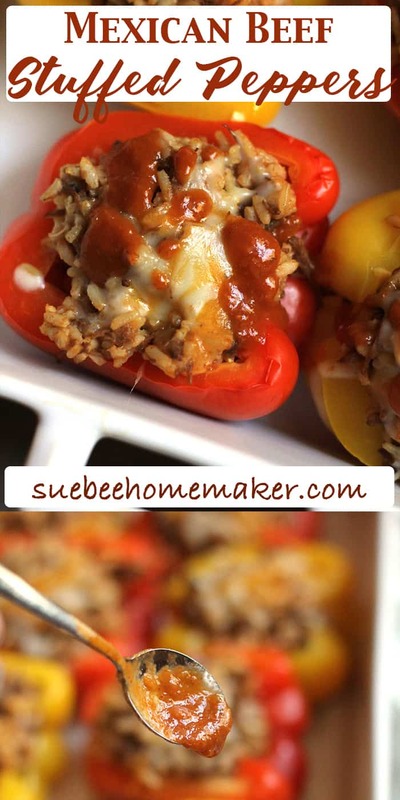 Shredded beef, onions, and rice combined with enchilada sauce - is stuffed inside colorful bell peppers. So delicious! Season beef on both sides with salt and pepper. Rub spices into meat. Preheat large sauce pan on stove to medium high heat. Add olive oil, and when hot, add roast beef. Brown on ALL sides (even sides - you have to hold it with utensil) until crusty brown. Remove meat from pan and set aside. Add olive oil to same pan and add olive oil and onion. After a minute, add beef broth, tomato sauce, and stir. Add beef back to pan and bring mixture to a boil and reduce to low. Cover with lid and simmer for 2 - 3 hours, or until meat is VERY tender. Remove beef and cool. Shred meat with two forks and set aside. Preheat oven to 400 degrees. Prepare a large casserole dish by spraying with Pam. Pour 1/2 cup of beef broth in dish. In a mixing bowl, combine three cups of the beef with three cups of cooked rice. Drizzle with one cup of enchilada sauce, and mix to combine. Cut the bell peppers in half and remove seeds. Fill each half with a big scoop of the beef and rice mixture. Top with Mexican cheese. Cover the dish tightly with tin foil. Bake for 40 minutes. Remove foil and bake another 5-10 minutes, or until cheese is slightly browned. Serve immediately with extra enchilada sauce, avocado slices, and cilantro. This dish is amazing and I like the idea of partnering with a Margarita!